Growing up, we always had breakfast for dinner on Sunday nights. Typically we would have scrambled eggs, cinnamon rolls and sometimes french toast. Every once in a while I like to try and bring back that tradition. While at the gym on Sat, I was reading the Sept/Oct 2010 issue of Cooking with Paula Deen (yes I like to read about food while I work out!) 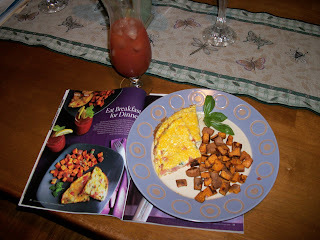 and there was an article titled Breakfast for Dinner. The recipes looked so yummy, and I had most of the ingredients on hand so I thought why not bring back the tradition this Sun night. Preheat oven to 400 degrees. In a small oven proof skillet, heat oil over medium heat. Add sausage/ham and sauté until browned (about 2 - 3 mins). Stir in tomato. In a small bowl, combine eggs, milk and salt. Pour over meat and tomatoes. Stir in cilantro/basil and cook until eggs set in the middle (about 3 - 4 mins). Sprinkle eggs with cheese and place skillet in oven (make sure it’s oven proof!). Bake until cheese is melted about 4 - 5 mins. Remove from oven and sprinkle with more cilantro/basil if preferred. Cut into wedges and serve immediately. Preheat oven to 450 degrees. Lightly spray baking sheet with nonstick cooking spray (unless you have a non-stick pan like I do). In medium bowl, combine sweet potato cubes, oil, salt and cumin. Place on prepared pan in a single layer. Bake until tender (about 15 - 20 mins). Remove from oven and enjoy! Oh by the way, I enjoyed a Bloody Mary also, but just followed the directions on the back of the bottle. Nothing too fancy -- ha! !